Maureen Hunnable played host at the Annual President’s Evening which was held recently at Rosegarth. A very appetising supper of lasagne, salad, new potatoes with a dessert of apple and redcurrant tart and cream was cooked and prepared by President Maureen and ably assisted May Hulme, this was served to fellow members. 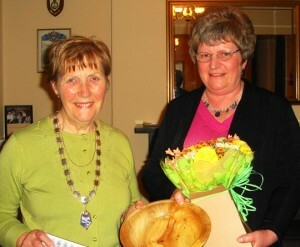 During the evening Maureen was proud to present the ‘Woman in the Community Award 2011’ to ex-soroptimist Christine Paradine. Christine retired in November as Manager at the Animals in Distress Rescue Centre in Ipplepen, where she had worked for the past 17 years. During that time the staff increased from just two to twenty four, she had cared for and rehomed over 10,000 animals who needed help due to a variety of reasons including domestic problems, financial reasons and bereavement. Christine now hopes to devote her time writing a book of “Stories from the Rescue Centre” which she thinks is going to take many years to write! We hope that now she has more spare time, she would like to become involved with the Soroptimists again, our membership is always open. After the presentation members had been asked to bring with them any item they may have at home that is either difficult to recognise or that is both old and interesting and perhaps with a story attached to its origin. Items included a Soroptimist’s Plaque carved out of a coconut shell, miniature dominoes, button hook, wooden carved ducks and even a hand made wool arrow cleaner for drying and cleaning arrows! Thanks were given by Mrs Shirley Wilkie who presented Maureen with a bouquet of flowers in appreciation of all the work she has done.